I hope everyone has been enjoying summer – it’s been crazy around here. 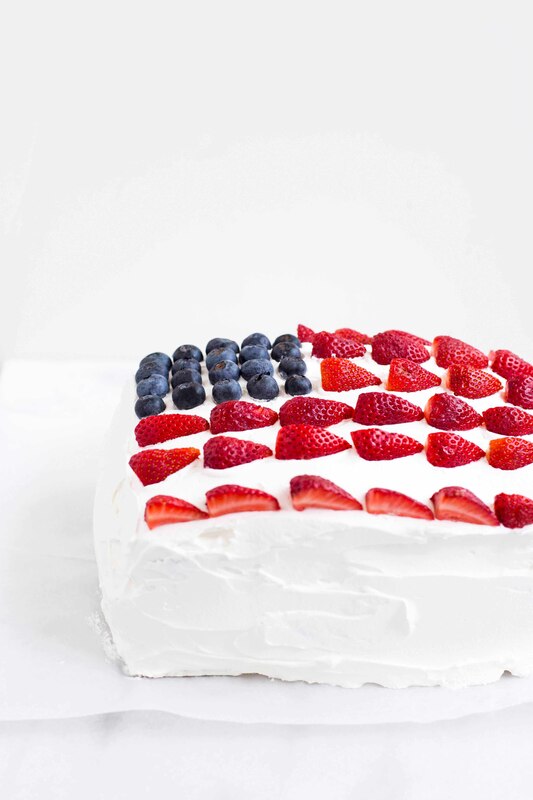 We’ve been busy with our summer schedule and I can’t believe that tomorrow is the 4th of July! 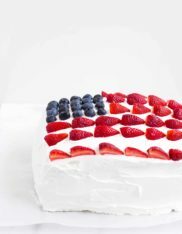 I’ve never made a flag cake but I’ve been wanting to because 1) I think the kids would love it and 2) I figured it would be easy to put together and very festive. I was right on both accounts. 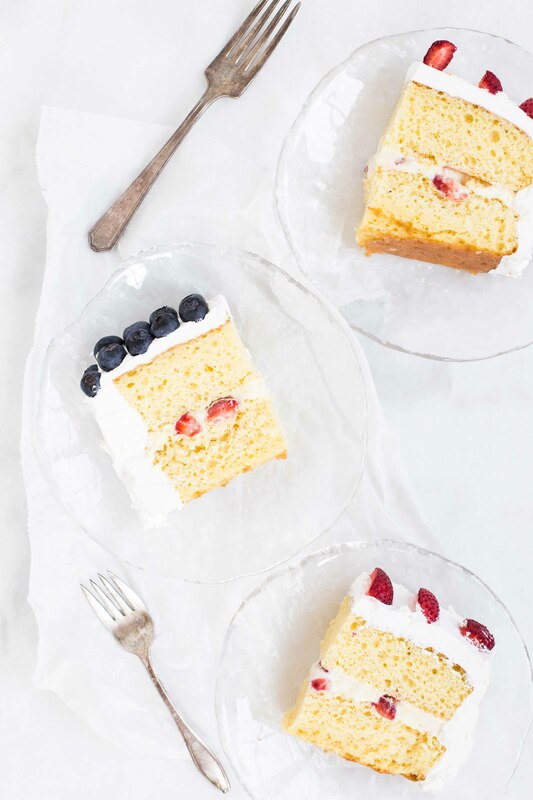 This cake is basically a modified version of my Strawberry Trifle — it’s also SO GOOD and light and refreshing. All you need to make it is: boxed yellow cake mix, instant vanilla Jell-O Pudding, Cool Whip and strawberries and blueberries. It’s also only about an hour of active work involved to put it together and very kid (and adult) friendly. So, I’ve also been a little absent over here because I’ve been working on the book in my free time, which is almost ready to print! I’m really excited to share it with you once we’re all ready to get back in the holiday spirit, haha. Until then, we’ll all just have to sweat in this summer heatwave. Happy 4th of July, everyone! I should be back with some more fun summer recipes soon! Make the yellow cake in a 9"x13" pan according to the directions on the box (it helps to line the pan with parchment paper, allowing some paper to hang over the edges so the cake is easy to remove from the pan) and allow to cool completely before removing it from the pan. While the cake is baking/cooling, make the vanilla pudding. Once it has set, add in the 1 cup of chopped strawberries and 1/3 cup of Cool Whip - mix until combined. Cut the sheet of cake in half so you have 2 smaller rectangles that are approximately 9"x7.5" in size. Place one half on the dish you're going to serve the cake on and place sheets of wax or parchment paper under the edges of the cake so that you have a clean dish once you're done frosting the outside. Spoon the vanilla pudding mixture onto the layer of yellow cake and spread it into an even layer (you may have a little bit leftover). Place the second sheet of cake on top of the pudding layer. Frost the entire outside of the cake with the remaining Cool Whip. 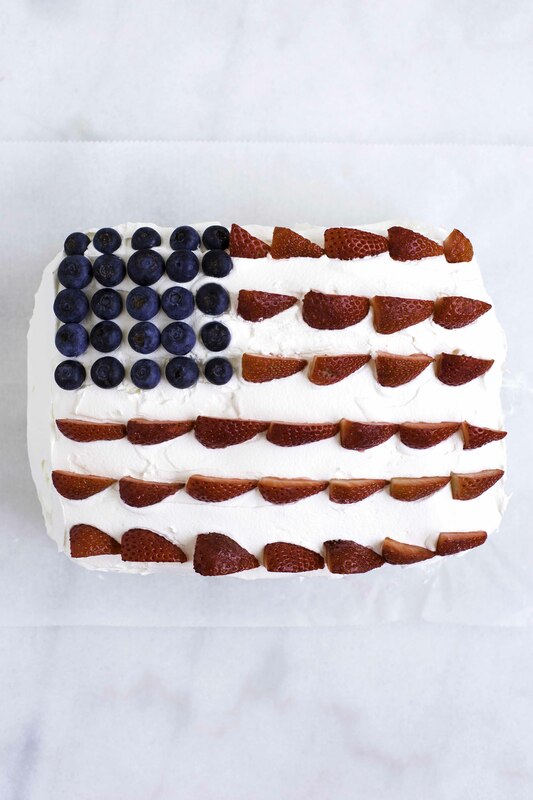 Decorate with the remaining strawberries and blueberries. Refrigerate the cake until you're ready to serve.